FX or DX? – Decisions, decisions…….. The Working Pro: Let’s say you shoot a lot of sports, and action and you use your gear day and night. You probably make thousands of images a week. You need a camera that can shoot in the pouring rain, and fire at a very high rate of up to 9 fps. You often have to shoot at continuous high for extended periods of time, so you must have a very large buffer in the camera. You also have to shoot in exceedingly low light requiring ISO’s of over 3200 on a regular basis. You’re in good condition and carrying a heavy camera or two is not a big deal to you. You shoot a lot of wide angle lenses and plan to buy one of the new fast lenses like the 35 f1.4 or 24 f1.4. Cost is not as important to you as having the camera that can do what you need to do. The Serious Photographer: You don’t make a living with your camera, but you use it a lot. If it’s pouring the rain, you’re catching some breakfast and waiting for it to slack up. 5 or 6 frames per second are plenty for your needs. You seldom need to shoot over 2o frames in a row. Size and weight of a camera matter to you and you prefer smaller to larger. You don’t shoot a great deal in very low light and seldom need to shoot over 1600. You shoot landscape, close-ups, travel, some people, but seldom action or sports. You take good care of your equipment and don’t abuse it. You have no real need for the new fast wide angles 24 f1.4 and 35 f1.4. Cost is a factor in all you equipment decisions. You’ve probably already figured it out. If you’re the Working Pro the most advanced Pro camera like the D3 or D3s are what you want and need. If you’re the serious photographer the D300s or D7000 are probably your best bet. 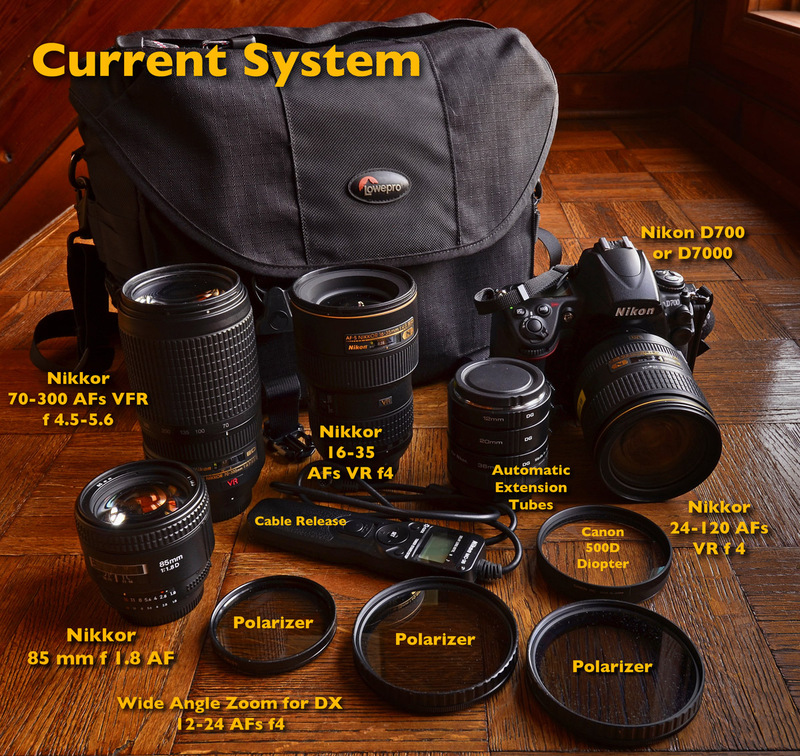 If you fall between the two categories the D700 may be just what you’re looking for. Now if you win the lottery, or inherit a fortune, you obviously can afford anything you want, at that point your only question might be do I mind carrying the heavier camera. What about mega pixels? That is another tricky one, first all modern camera that I’m familiar with, (which would be the current Nikon DSLRs), have more than enough mega pixels for almost anything you might want to do. Remember that the more mega pixels the bigger the files, which is both good and bad. Good in that more file sized means richer files that can be blown up a great deal larger, bad in that storing very large files means bigger, faster cards and more hard drives. I could not tell you how many you need, but one way to know is ask yourself if the mega pixels you’ve been using are holding you back from anything you have needed to do, if they are, you know what comes next! Lenses? Today most manufacturers provide a wealth of lens choices, I certainly know that Nikon does, there are very few choices you might want to make that are not provided. If you must have super fast wide angles, then FX is the ticket, however if you simply need super wide the 10-24 gets you into super wide at a reasonable f4 maximum aperture. Let’s take a practical lens comparison. I happen to own the new Nikkor 24-120 AF-S VR f4 on the D3s or D700 it is a 24-120, on the D7000 it the equivalent angle of view of a 36-180. On the D7000 I miss the 24mm end but love the 180 end. If you think you would miss the 24 end more than you would most likely live happier with the FX, if you like the long end being effectively longer you might just be a DX shooter. One thing is for sure, I’ve seen and, made myself, wonderful images with both formats. In an ideal world I would own one of each, then you would have all the advantages of both formats. But, take heart, if your budget keeps you in the DX range, you’re still dealing with formidable picture making machines! The best news is, you can’t make a bad decision! Now get out and enjoy making images………..
One of the things that I love about being a Nikon shooter, (yes, I do work for them, but I’d say this anyway! 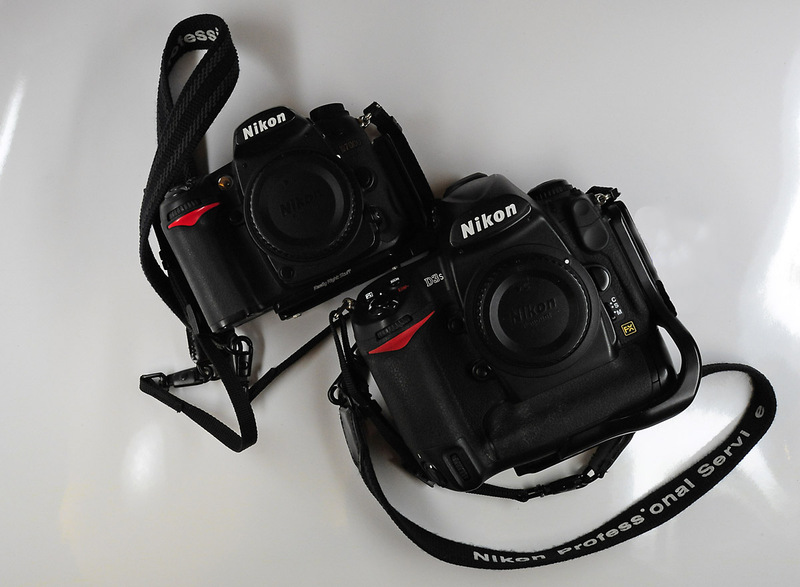 ), is that we have never changed our lens mount, the tried and true Nikon F mount is still going strong. So what’s the big deal? Well if you were a Canon shooter in the 60’s – 80’s or for that matter a Pentax shooter or Olympus shooter, and you saved a bunch of great old glass (lenses) they wouldn’t work on your new DSLR! That’s a big deal because Nikon made some sterling manual focus glass for many years and virtually any of them can still be use today on our current, higher end DSLRs. if you own a D7000, D700, D3s or D3x you can still enjoy all that old great glass. To the right are four lenses I really love, left to right, the 50-135 f3.5 Nikkor, the 80-200 f4.5 Nikkor, the 105 f2.5 Nikkor and the 24 f2.8 Nikkor. All of these lenses are legendary in their optical performance and work wonderfully on our current cameras. Now you may be thinking but they are manual focus!!!! Actually for some kinds of photography and for video the older manual lenses are a perfect fit. The older lenses have depth-of-field scales and that is very handy when your shooting for maximum depth-of-field using Hyper-focal distance. It’s an old trick from old guys like me, but it really works and when working slow and carefully it can give you wonderful results. In the next few months I’m going to start a project of shooting with the old glass and try to show some examples of just how terrific this classic glass can be. the great news is that many older manual focus lenses can be bought for a great deal less than current lenses. Now don’t get me wrong, I own and use a number of the current, latest, greatest Nikkors, but it’s fun sometimes to step back and remember how tact-al photography was in the old days. I bought the 80-200 above some years ago for $120., the 24 f2.8 for less than $150., I’ve seen mint condition 105 f 2.5’s for under $150. These are great lenses and the smooth focus makes them also perfect for video work. 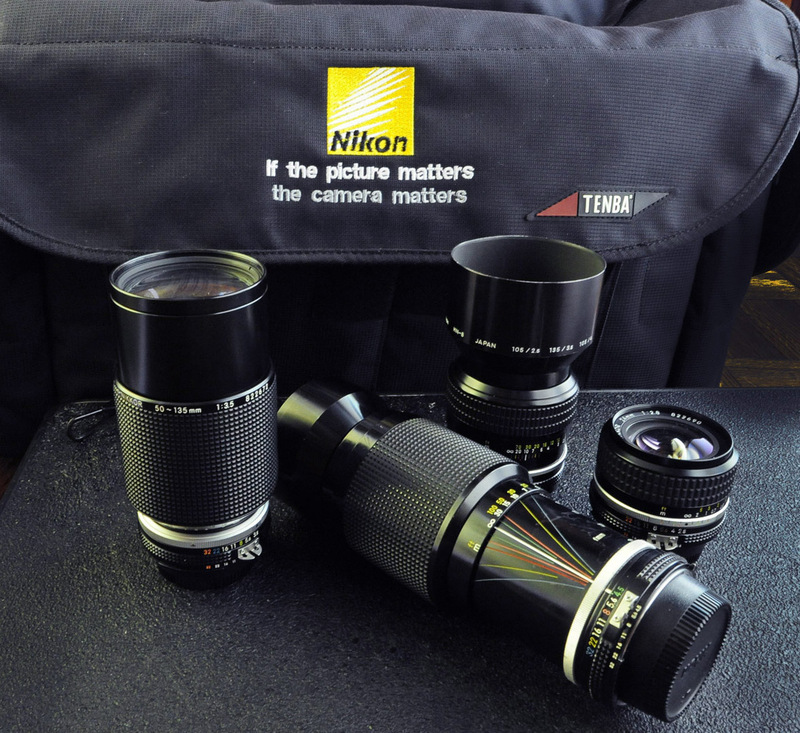 If You’re a Nikon shooter you can make these lenses available to yourself, if you shoot other brands….. not so much! I look forward to wringing them out for you. Welcome to the very first Learning Center post for the new website. This is an article that ran in the Pilgrim’s Chronicles blog back some time ago but I wanted to update and thought this would be a good lead off session. I’ve struggled for years with how to be ready for any situation in the field and yet have a small enough package that I didn’t feel burdened with too much to carry. First I want to keep my bag or pack to below 25 lbs., actually as far below as possible. My current field kit comes in complete at 23 lbs. That’s good enough for now. the older I get the further down it will have to come. 2. I need to cover focal length equivalents of from 20mm to over 400mm. With the Nikon 12-24 AF-S WA zoom, the Nikon 24-120 AF-S VR Mid-range zoom, and the Nikon 70-300 AF-S VR longer range zoom I get everything from 18mm to 450mm covered in three lenses. And of course my trusty Len Baby Composer with close-up lenses as well! 3. I really want to be able to shoot close-up to 4 times life-size. The handy, compact, and very sharp (and reasonably priced), 85mm Micro-Nikkor AF-S VR f3.5 lens is perfect, add to that 3T and 4T diopters and you have a killer close-up system. I also carry the Canon 500D for the 24-120 and Automatic extension tubes and I’m more than good to go. 4. The Lowe Pro Stealth Reporter 400 AW or the Trekker 300 AW backpack each hold all this gear and stay in my weight range (the backpack is a hair heavier but is easier since you carry it on your back. 5. Tucked away in either bag is a Nikon Coolpix P300 for those grab shots when the gang and I are whoofing down a burger! 6. In the illustration above the 85mm Micro Nikkor is replaced with the 85mm f1.8 lens when I need to work in low available light. 7. Polarizers for all lenses, a Singh Ray Variable Neutral Density filter, a small table top tripod, charger and spare batteries, mini flash light, plus cleaning supplies and allen wrenches and you’re good to go! To pad things in the bag I also stuff in a dozen or so micro fiber cloths. 8. Of course a full size tripod and ball head are salted away in the back of the vehicle. 9. A spare body, a D700, and it’s dedicated wide angle, the Nikkor 16-35 AF-S VF f4 lens will be packed with the computer roll on bag. So there you have it, a full compliment of lenses and a very capable body ready to tackle almost any subject. Since I won’t be worried carrying it all I will get better images! At least that’s the plan. This is the system I will use in New England in two weeks, we’ll see how it does!